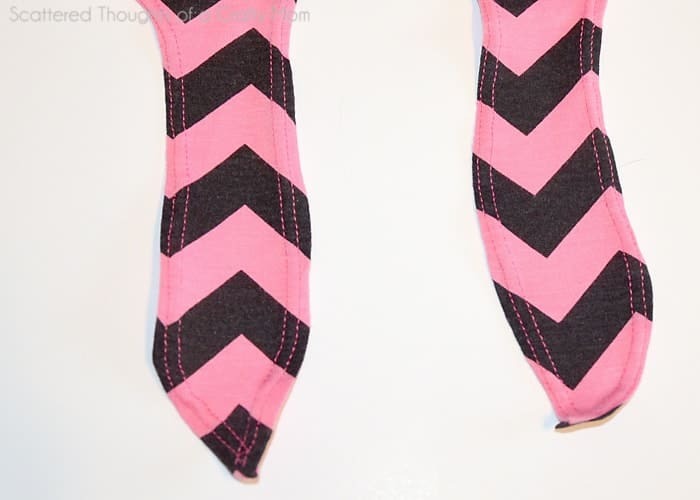 Seam allowance is 3/8 inch with a 3/8 inch bottom hem and 1/2 inch sleeve hem. Pattern is designed to hit at low waist/high hip level. Shorten or lengthen as desired. 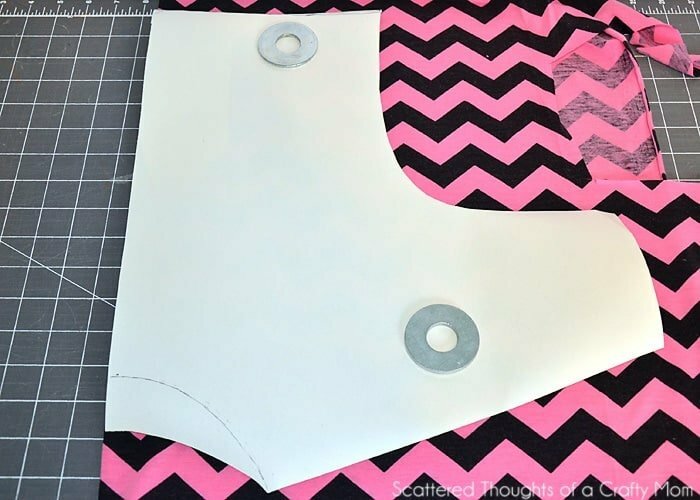 Assemble the pattern and cut out pattern pieces. 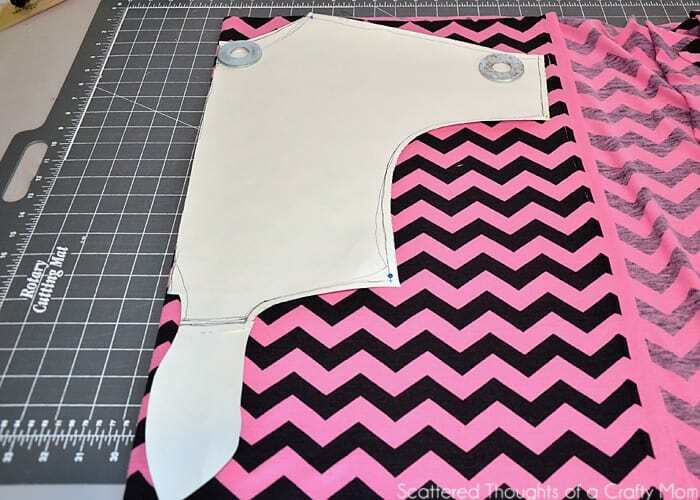 Lay out your fabric, so the most stretch is going side to side. Fold one side over, selvage toward the middle (until you have enough width to to cut out the sleeve.) 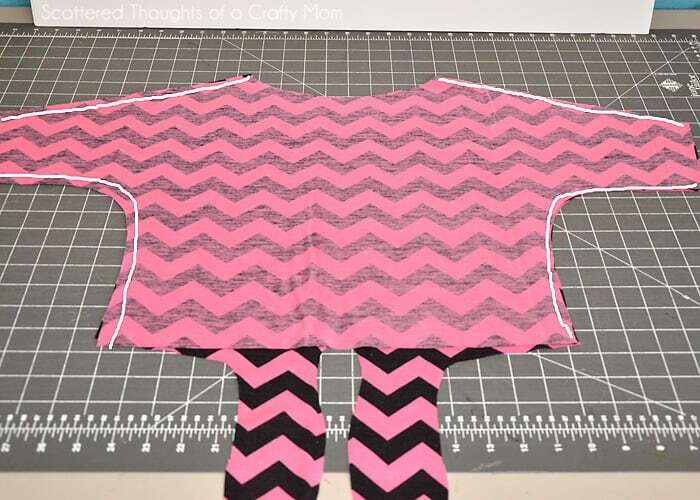 Place the side of the pattern on the fold and cut out the front piece. Cut out the back piece and the neckband. Place the front and back pieces right sides together and sew along the shoulders and side seams. 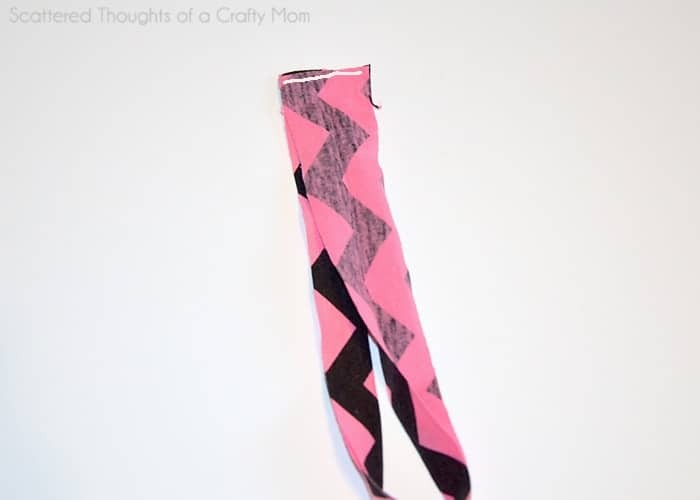 Use your iron and press the bottom edge of the entire top over 3/8 inch (including the ties). 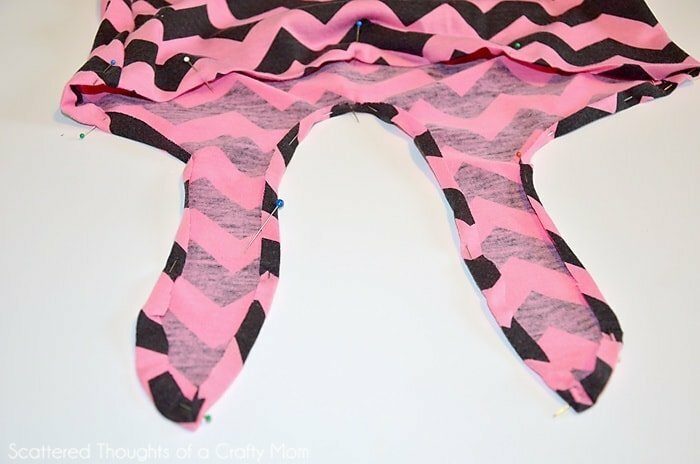 Use pins if you need too and when you get to the curve in between the tie, it’s ok if you need to stretch the fabric a little or even if you need to cut the shape slightly more circular. Once the top is tied, you can’t see this seam edge anyway. 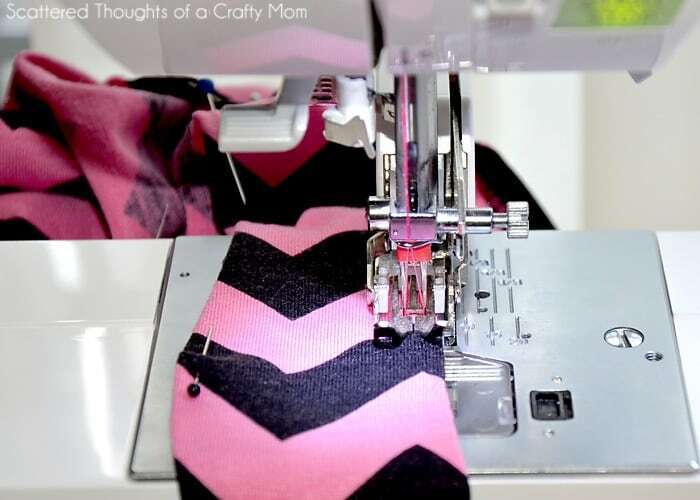 Using your double stretch needle, sew along the bottom edge of the top, including the ties. When you are using a double needle, you can’t pivot on turns like you normally do. I just sewed to the end, lifted my needle and presser foot and manually turned the fabric. Step 4: Adding the neck binding. 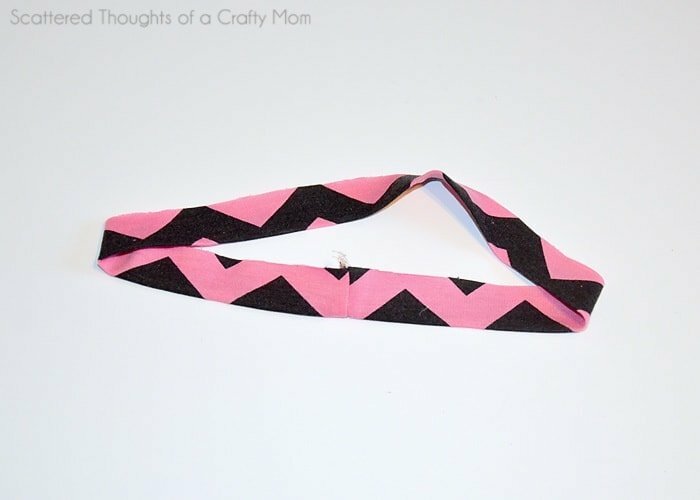 The neck binding for this pattern is designed for a ribbed knit or other very stretchy fabric. 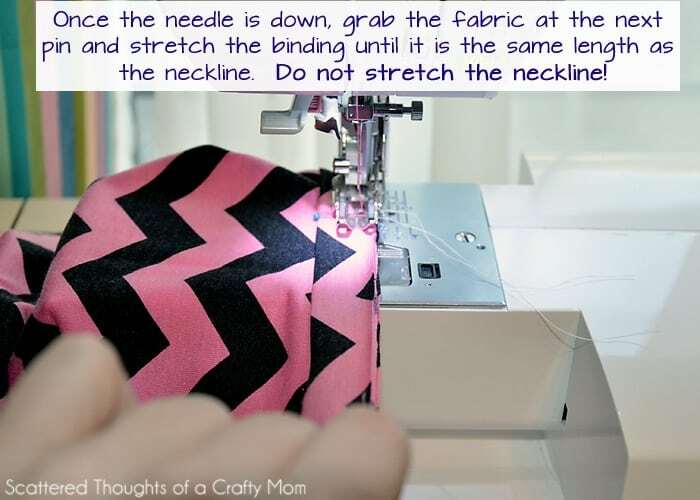 If you are not using a super stretchy fabric, I recommend making your own binding measurement by lining up the front and back neckline and measuring the neckline width. (the front is deeper than the back, so shoulder seams will not be the edge. Once they are lined up, multiply by the measurement by 2 for the entire neckline measurement. 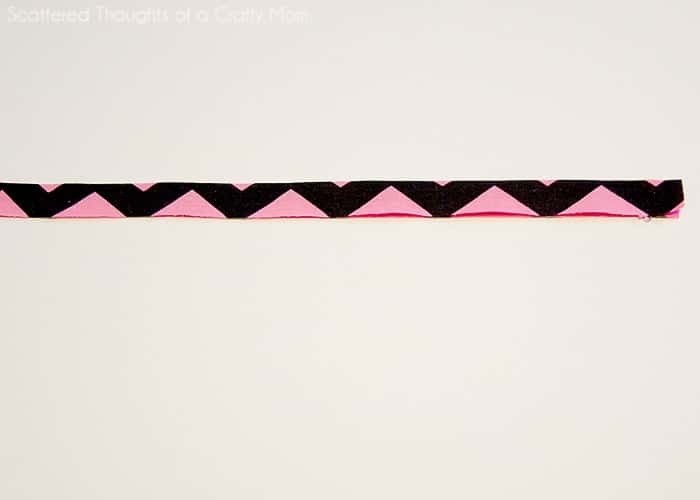 Multiply that nuber by .9 and cut a piece of your knit fabric to your number. Fold the binding strip in half wrong sides together and press. Open the strip, line up the short raw edges and sew together with a 1/4 inch seam allowance. Using pins or a fabric marker, divide the binding into 4 equal sections and mark the spots.Do the same thing on the t-shirt neckline. Keep in mind, the shoulder seams will not be the exact halfway point because the front neckline is slightly larger because of the dip. 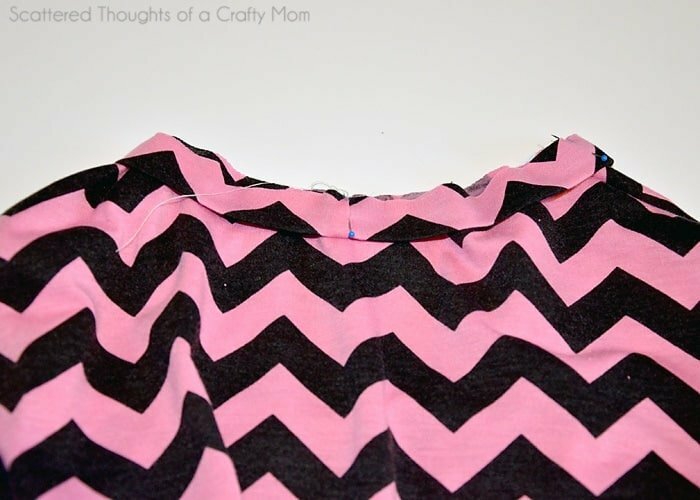 Line up the 4 marked spots on the neckline and binding and pin the binding to the t-shirt. The binding should be smaller than the neckline and the extra fabric should be evenly spaced along the binding. 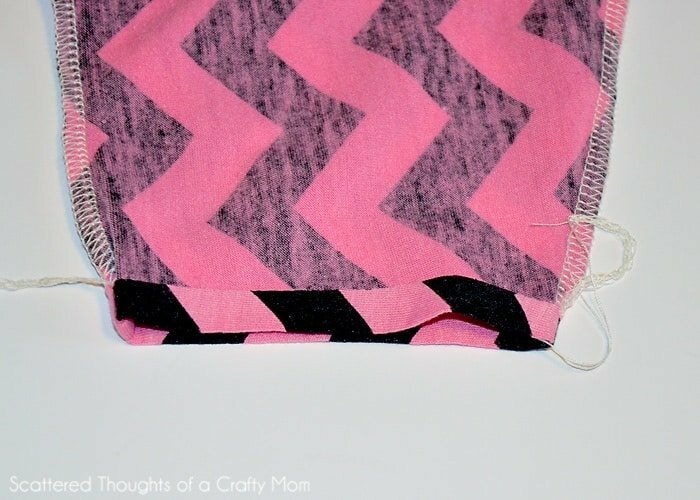 Use a straight stitch and sew along the edge using 1/4 inch seam allowance, stretching the binding evenly from pin to pin. Fold the sleeve edge over 3/8 inch and press. 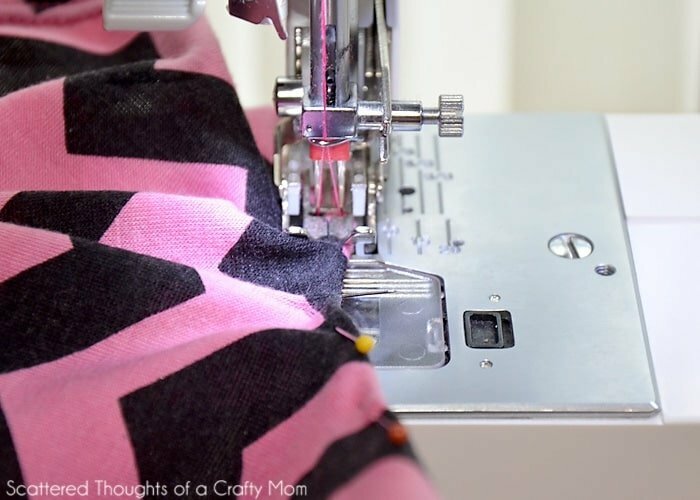 Using your double needle and walking foot, sew along the edge of the sleeve. Have fun and I can’t wait to see what you make, please come back and share! This is so cute! I pinned it because I want to make one in my own size. This is really great ! I want to make Lily one! 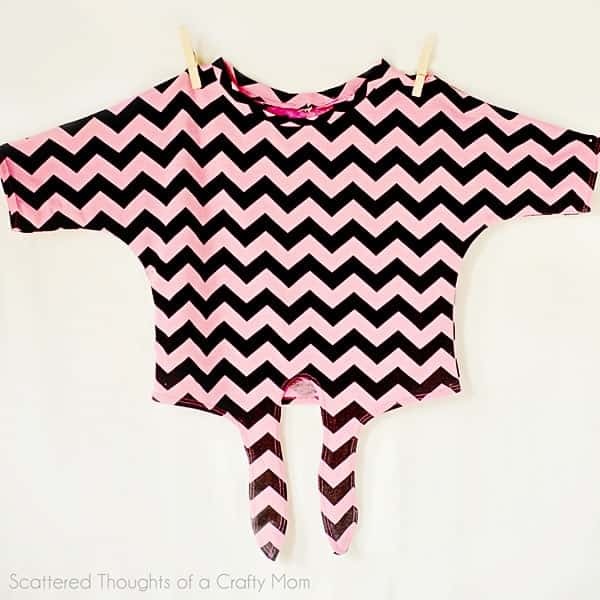 This is soooo adorable cannot wait to get started on one for my granddaughter, and will make one or more for me!!! would I just follow same instructions for adult size and enlarge the ties? 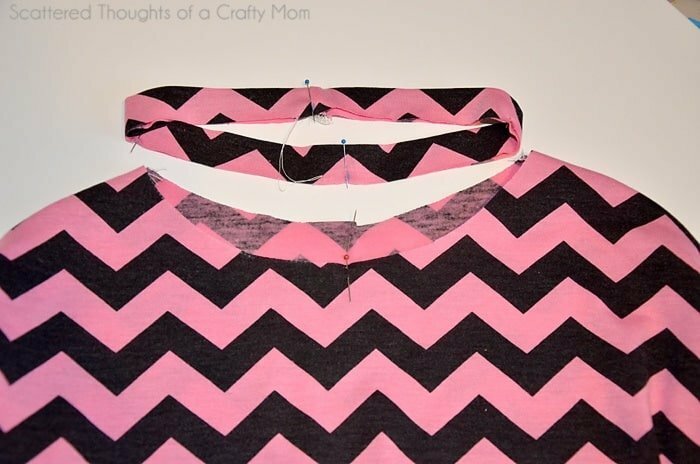 Fabulous top and a great tutorial! 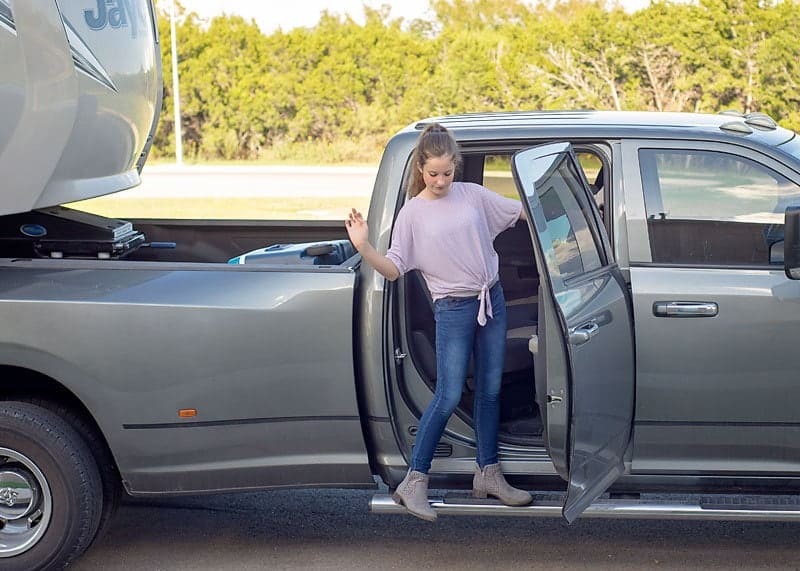 I so want to try this out for my girls – pinning it for later! Thanks for the inspiration! So cute! I pinned this to try later for my girl, and maybe one for me 🙂 Thanks for the tutorial! That turned out adorable! Thanks for linking it up at Monday Funday! The little girl I nanny and I look through link parties together to find ideas for clothes to make and we just love this! Thanks for the instructions! Love this top! Pinning it! Has anyone else reported issues with downloading the pattern? 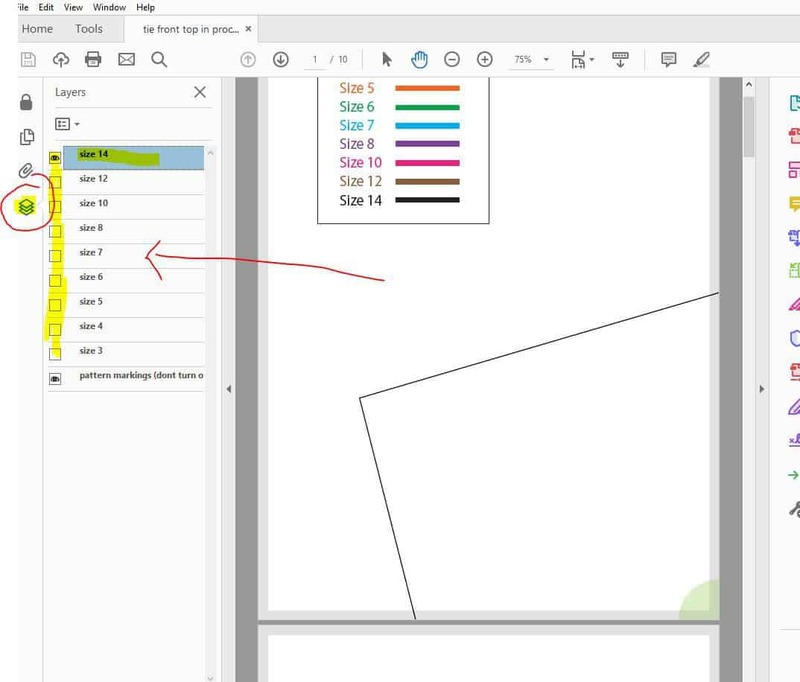 The file is so large that a preview won't display and the estimated time to download is 17 minutes! Help! Beautiful!! You did a wonderful job on it. Thank you for sharing at Sharing Saturday!! I am visiting you from Saturday Sew & Tell. I can see you are really good at making your own pattern. I think that once you have that confidence the only limitations are you imagination. Great tutorial; darling pictures! 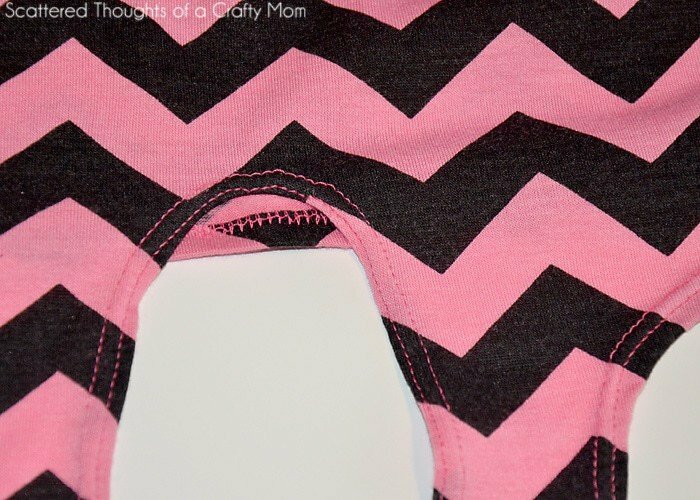 I love how simple this is…with beautiful results (I'm envying the zigzaggy fabric). Thank you for sharing this. So adorable!! Love that fabric too! THANK YOU I’D LOVE ONE OF THESE SHIRTS FOR MYSELF….THANKS FOR THE CUTE PATTERN…. Me too, I plan on doing a similar one for adults. Hi and thankyou for the pattern! 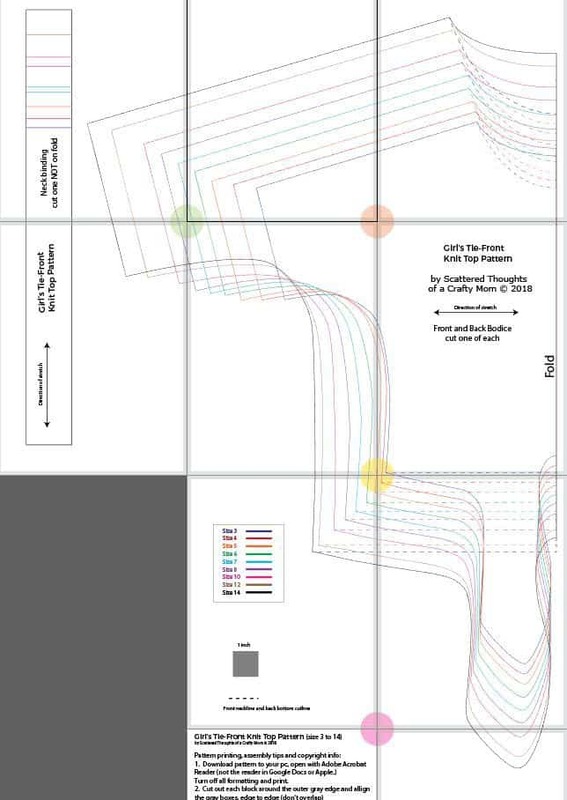 Sadly I cannot work out how to choose print in layers. I have done it with other patterns, what am I missing?